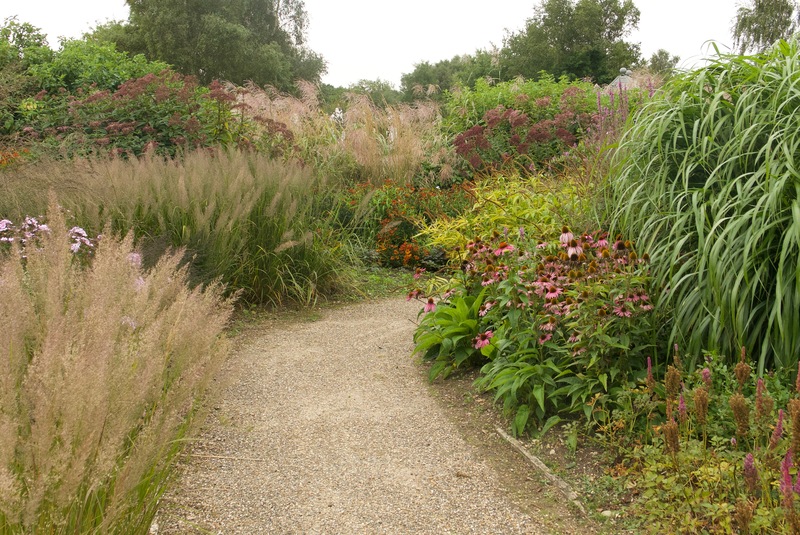 Over the last half dozen years or so, I’ve visited several gardens in England designed by the Dutch plantsman, Piet Oudolf. These include Bury Court in Hampshire, Scampston Hall’s Walled Garden in Yorkshire and Hauser & Wirth in Somerset. Because I’ve seen and enjoyed these gardens, I was eager to see Oudolf’s Millennium Garden at Pensthorpe Natural Park in Norfolk. 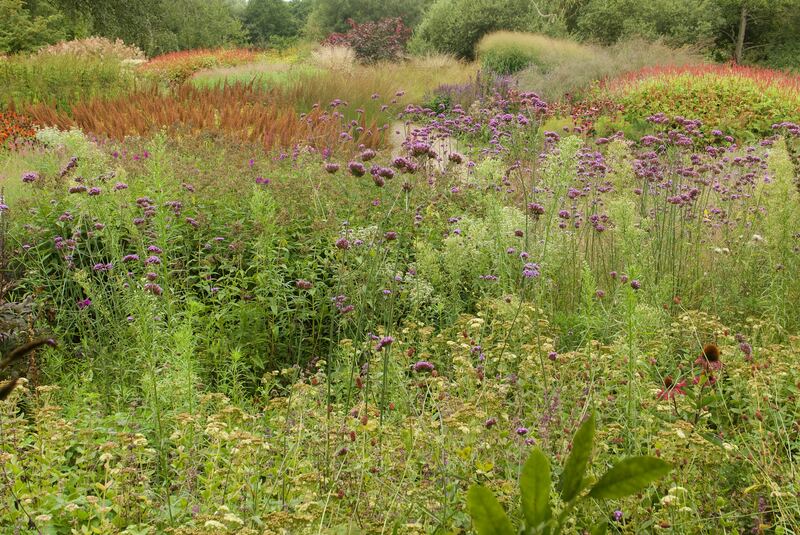 Pensthorpe was Oudolf’s first commission in the U.K. Planted in 2000 and up-dated in 2008, the Millennium Garden is part of a larger natural reserve. Built on the site of former gravel quarries that left behind a patchwork of lakes, the watery location is designed to attract migrating and resident birds and to encourage families to understand and enjoy nature. Since the most recent work in the Millennium Garden is now ten years old, I was eager to see how — or if — Oudolf’s approach to planting had changed from what I’d seen at other gardens in England. Would the early date and the location make a difference in the plantings, and if so, in what ways? One difference was obvious as soon as I entered the area. A natural element — birch trees growing close together — marked the entry rather than a gate in a wall or a door into a courtyard. But this was far from the only difference. At Bury Court, Scamspston and Hauser & Wirth, you look at the plants. You observe their particularities — their colours, textures and growing habits. At Pensthorpe you are engaged with the plants, almost swallowed by them. 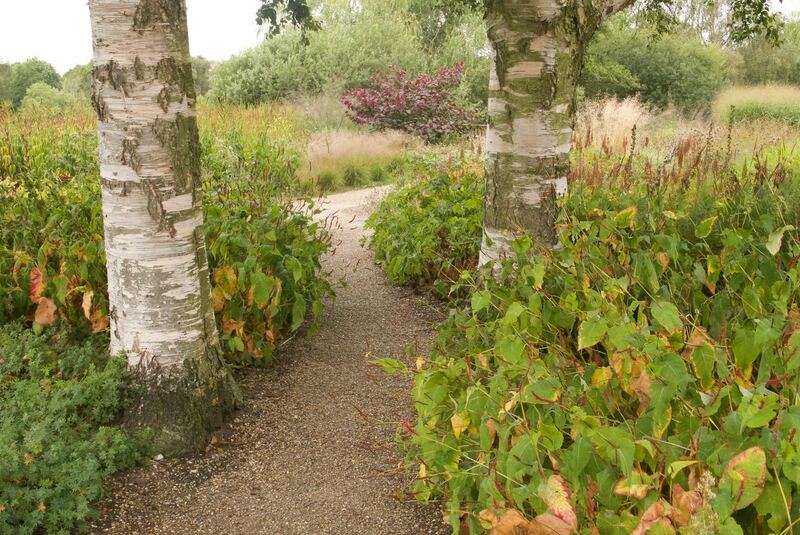 The contrasts in colour and texture that you see at Bury Court, Scampston Hall and Hauser & Wirth are present at Pensthorpe, but added to these elements are the sounds of nature — birds calling, wind soughing through the trees. 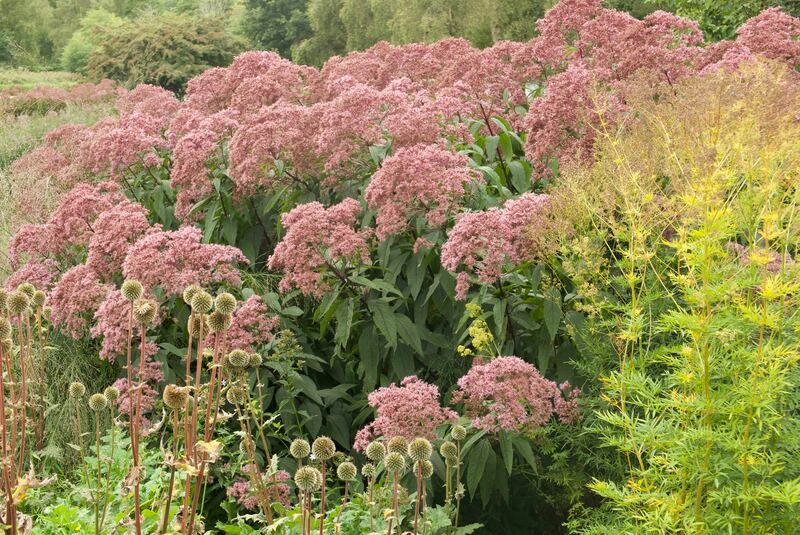 The flowers on these Eupatorium purpureum were larger than any I’ve ever seen. Topography is also a factor. 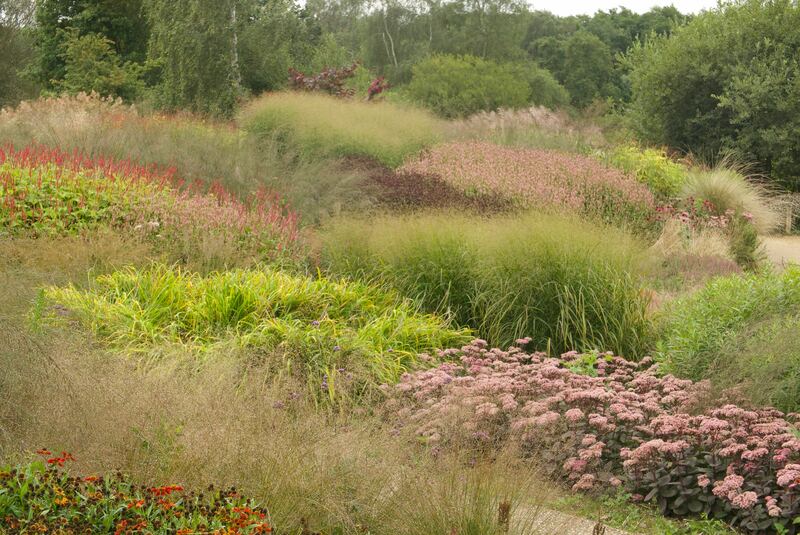 The other three gardens that Oudolf has designed in England are on flat land. 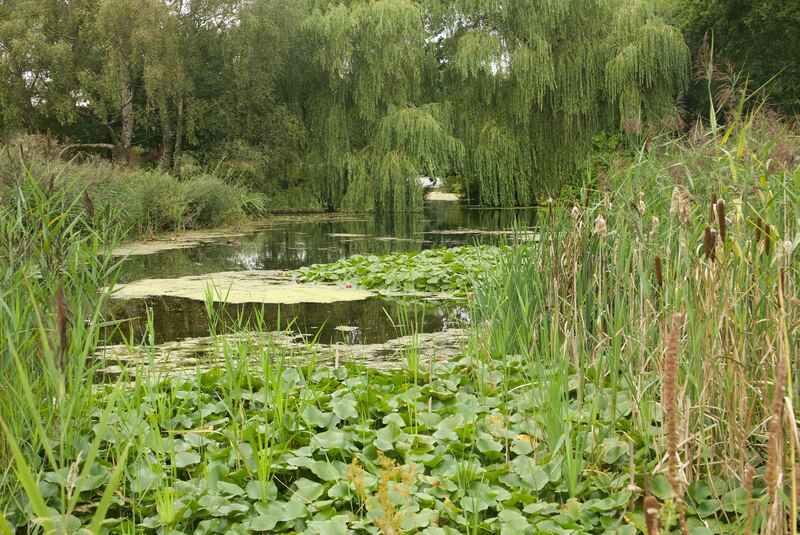 At Pensthorpe, the land slopes down to a small lake, one of many that dot the nature reserve. Because of this difference in topography, I found Pensthorpe much more immersive than the gardens at Bury Court, Scampston or Hauser & Wirth. Walking along a path that meandered down the slope, I sometimes felt like a giant Alice in Wonderland, looking down on the plants, and sometimes like a tiny Alice, with plants towering above me. I was aware, too, of the blocky nature of the planting scheme. In my memory, the plants at Hauser & Wirth intermingle. One block of plants oversteps its boundary and drifts into the block next door. What I saw at Pensthorpe were big areas that contained a single plant, with each area or block an entity unto itself. What struck me most strongly, though, was how undesigned this garden felt in comparison to the others. This is not to suggest that Oudolf threw out seeds and plants willy-nilly. Far from it. But the overall atmosphere of the Millennium Garden is natural, as if all these plants just happened to be where they are. Not so at Hauser & Wirth where the circles of grass that are such a distinctive feature bring design to the fore. The same is true in the Walled Garden at Scampston Hall — a garden that I like very much. The five acres there are divided into nine garden rooms, each with its own character. There is a reflecting pond, a mount, semi-traditional borders and a circle where miscanthus explodes like fireworks. But most memorable for me are the curving drifts of Molinia, separated by curving strips of lawn, that Oudolf planted in one garden room, and the hedges that mimic that curving line in another. At Pensthorpe, befitting a natural reserve, things are simpler. Plants are the focus. 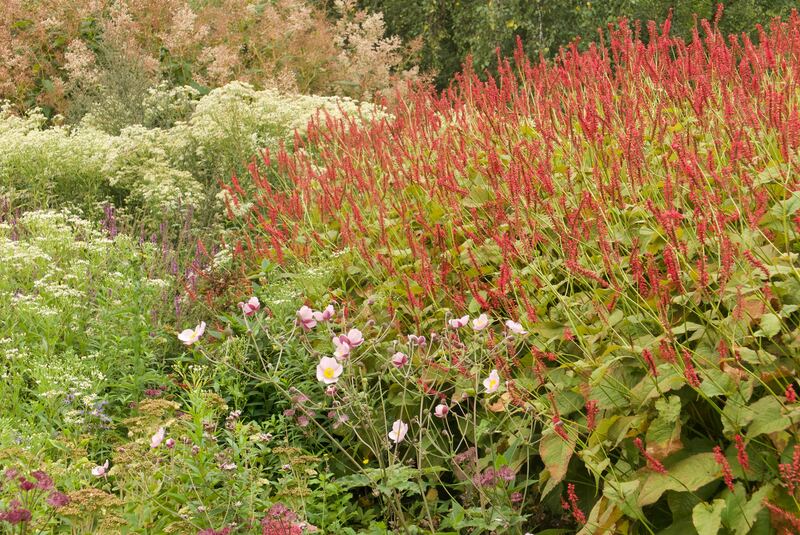 Big, blocky, glorious plants that rejoice in their autumnal colours. This is the first time I’ve seen one of Oudolf’s English gardens in the autumn, when the seed heads that are so important to him are prominent features. Seeing them, I think of the opportunities that were wasted for so many years, when seed heads were chopped off as soon as the flowers faded. 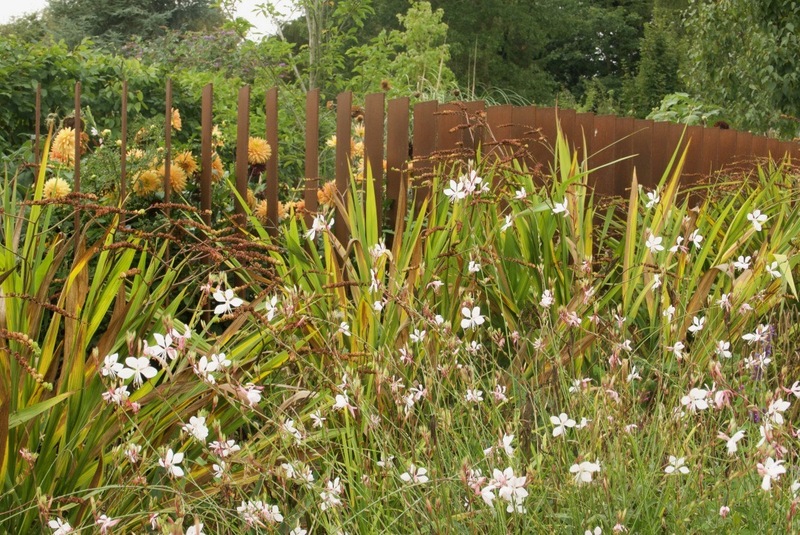 Near the Millennium Garden, a children’s play area offers a fine contrast, as does the Corten Infinity Garden that follows, where a fence seems to open and close as you walked past. 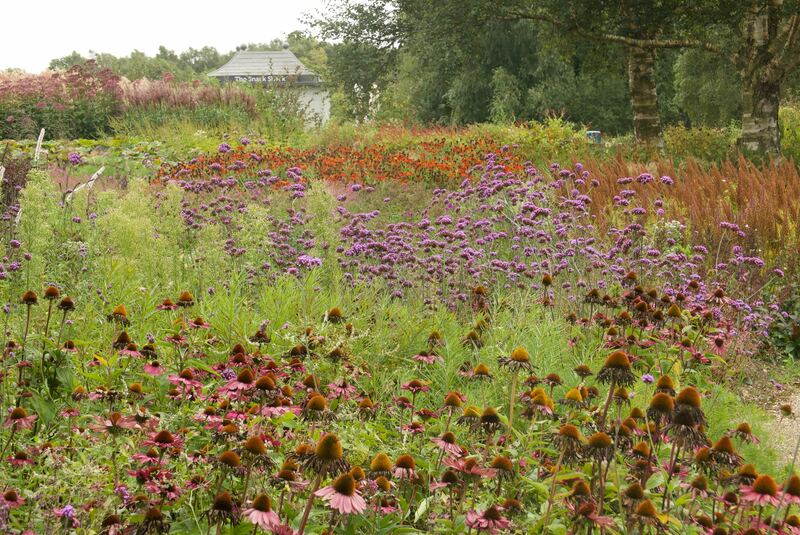 Neither was designed by Oudolf but both seemed to partake of his innovative spirit. Pensthorpe would be a great place to spend the day, with children or grandchildren, or simply on your own. I’d be happy to return. Very interesting (and a long way from here, sadly!). 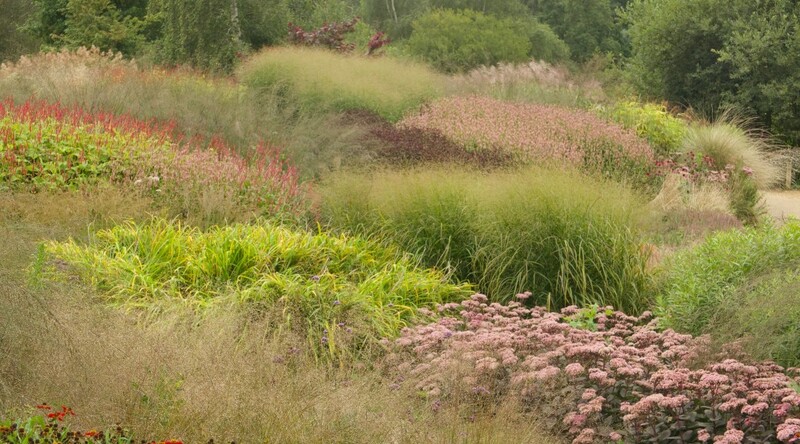 I’ve often wondered about the number of flat Oudolf designs and what a sloping one might be like. It is such a major factor in the experience of a space. Sounds great. I really liked the Oudolf plantings and the Nature Reserve generally. It was wonderful to see so many young children enjoying themselves outdoors. Former quarries are the best as Butchart Gardens here in Victoria. I found the pounder from crushed rock makes excellent fertilizer too. That quarry at Butchart is amazing! Yes, I figured that out! Those other Oudolf gardens that you visited–did you write posts about them? If so, you should link to them in this post. 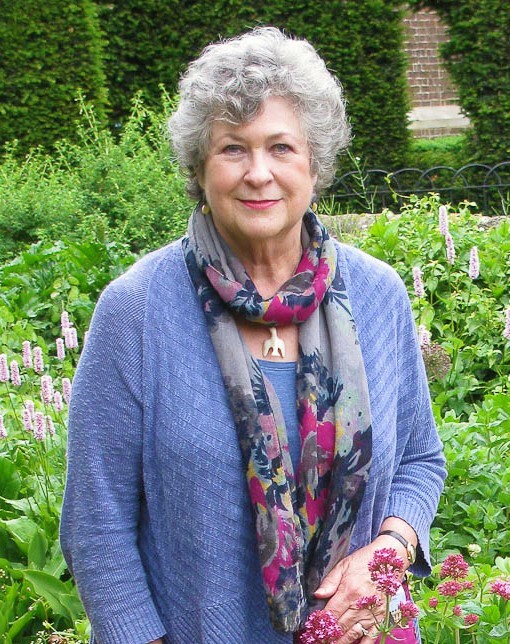 I tried searching for Scampston Hall’s Walled Garden in your blog’s search box but came up with nothing. Thank you for this suggestion, Kathy. I have inserted a link to Scampston Hall’s Walled Garden. I haven’t written about the other two although I did refer to Bury Court in a post about garden visiting. Beautiful. I love the patchwork effect of the grasses. Also that big patch of Joe Pye Weed! I liked this planting as well as any by Oudolf that I’ve seen.